Disclosure: We received a complimentary trip from Hampton by Hilton, but all opinions are mine, and I love the waffles. Are you ready to start making those vacation plans? Anytime of year is the perfect time to plan a Seekender weekend! A Seekender is a bold adventurer who likes to take advantage of three-day weekends, during the summer or even over holidays to pursue their passions. We love taking long weekend trips with our girls because we can visit and explore new places, without being overwhelmed from being away from home for too long. 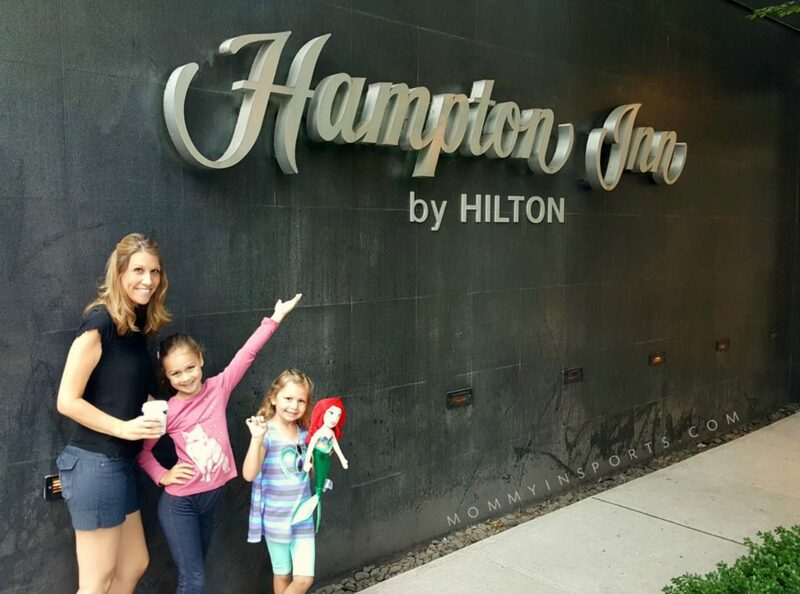 And I was lucky to be asked to be a part of the Hampton by Hilton Ultimate Seekender team, and take our girls on a trip to New York City! However travelling with kids can sometimes be challenging if you don’t plan properly. 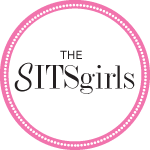 So I’ve decided to put together some tips of what we learned when we brought the girls to the Big Apple over Memorial Day! These tips will ensure you have a fun, stress free, Seekender weekend with your family, and start making some of your own memories! It’s so easy to try to pack in lots of activities, but it’s so important to just choose a couple of things you really want to do and see, and let the rest just fall into place. 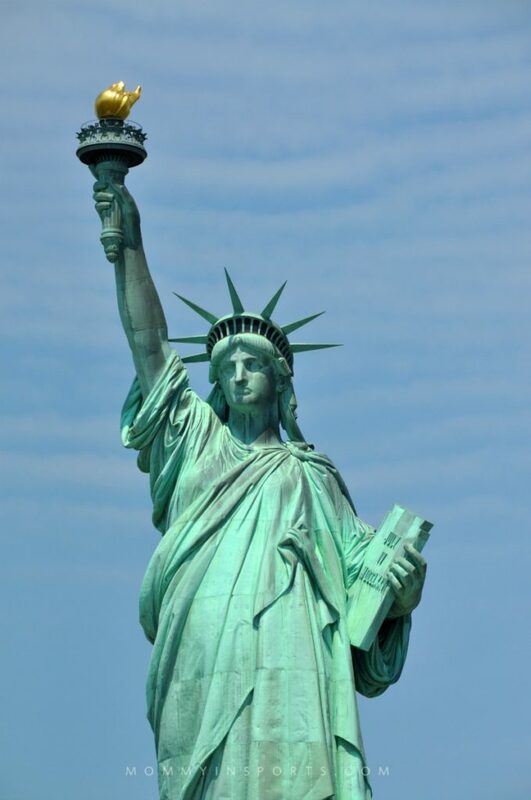 We focused on the Statue of Liberty, because my daughter was learning about it in school, and the Central Park Zoo. 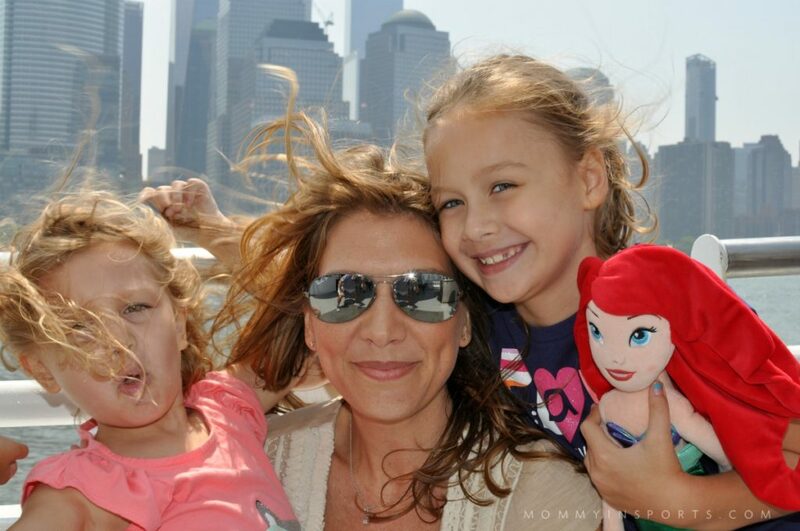 The Circle Line Tour was a perfect 90 minutes to the Statue of Liberty and around Manhattan for kids! New zoom lens rocks ya’ll. 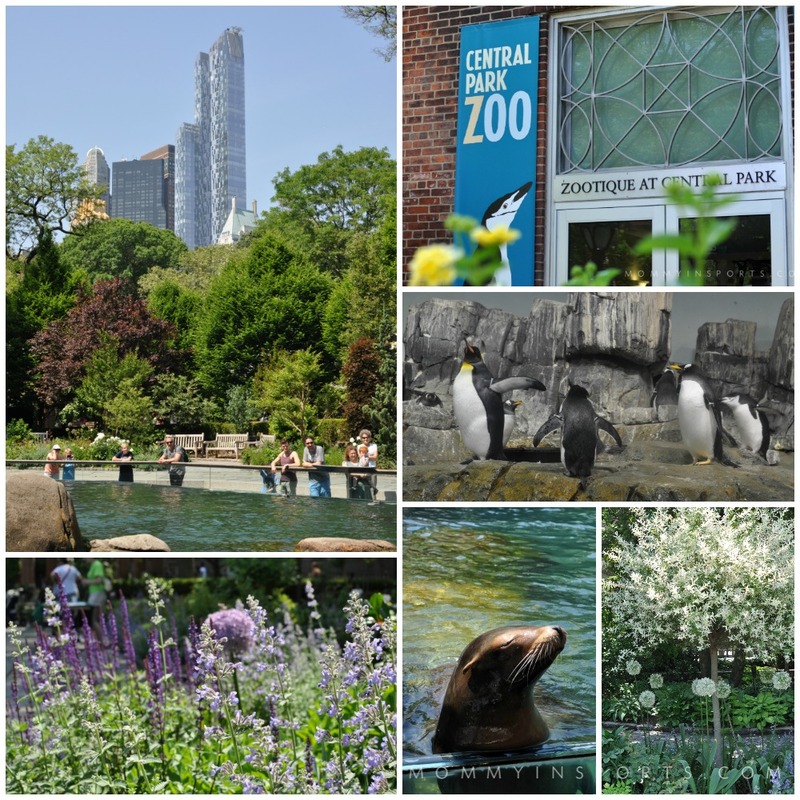 Central Park Zoo is an oasis in the middle of the city, and I was floored by the gorgeous gardens and posing sea lion! We had never visited either of these attractions, so it was fun to just explore like a tourist, and experience these new places together! 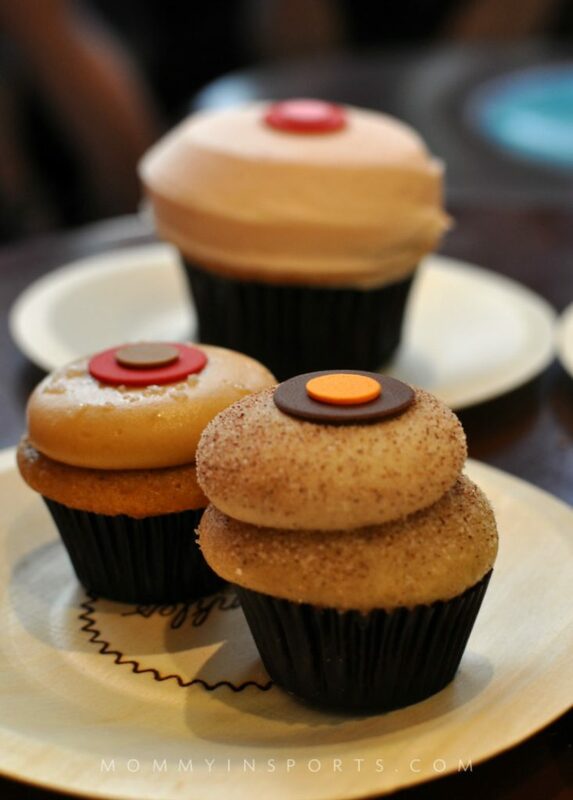 Everything else was icing on the cake…or the cupcakes! And we tried a lot of those too! With kids, you always have to expect the unexpected. The morning of our flight our little one woke up with a cold. So we packed lots of meds, ear planes (highly recommend these! ), and ear plugs for my husband and I so we wouldn’t be woken up if she was coughing at night. You never know how the trip will go, so keep expectations low and you’re sure to have fun. Oh, and don’t forget your stroller at the airport, doh! Again, this was unexpected but luckily we were able to pick up an inexpensive one in the city. As a writer, blogger, and type A planner, I always scour blogs before we hit the road. Mommy Poppins is one of my favs for NYC and other regions as well. But search the area where you’re going for kid-friendly restaurants near the attractions you’ll be visiting. It makes life so much easier! 4. Throw Out the Diet! This is a hard tip for this Paleo clean eating mom, but I always splurge a little on vacation. Sure I scour Whole Foods when we get to our destination and stock up on green juices, water, and healthy snacks, but you have to have a little fun right?! 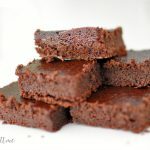 And don’t worry about sugar overload with the kids, they’ll get back on track soon enough! And yes we devoured every popular sweet in NYC, can’t wait to share who won the taste test! Of course where you stay can make or break your trip, so make sure you are choosing the right hotel for the value. We’ve stayed at Hampton by Hilton’s on our last two trips, and love that with 2,100 properties globally, they’re everywhere you want to go! 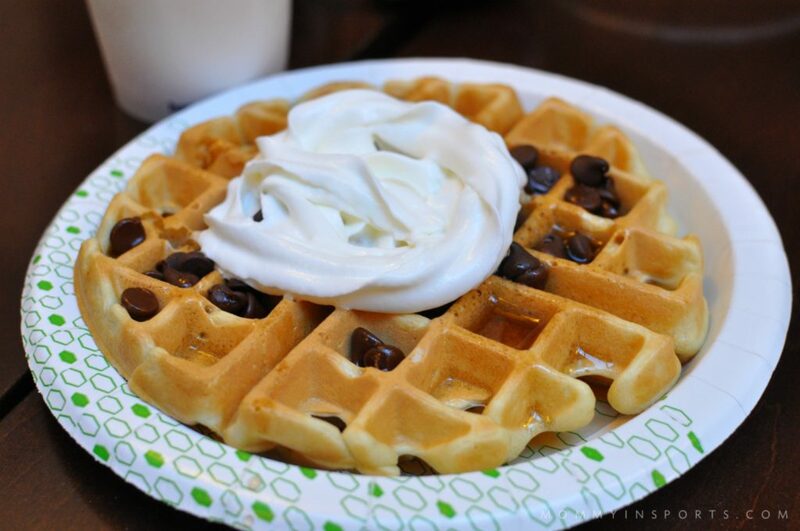 I mean…how can you NOT make waffles every day? 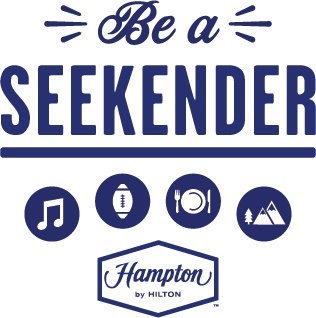 Plus the amenities are perfect for families and include: complimentary Wi-Fi, Hampton’s On the House® hot breakfast, free fitness center, Hampton’s On the Run™ Breakfast Bags if you’re in a hurry, and Clean and fresh Hampton bed®. Our girls are obsessed with the waffles, and the coffee is pretty good too, we all loved the cups! 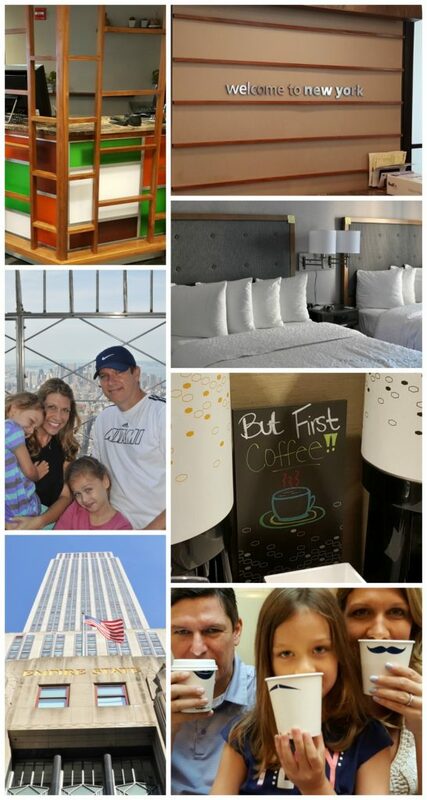 We chose the property in Chelsea which was walking distance to the Empire State Building, and Kleinfelds! Woo hoo! Keep in mind when booking accommodations, that price isn’t the best determination of the value of your stay. Try to get the most bang for your buck and choose a Hampton by Hilton property! If you are starting to make summer travel plans, please consider taking your own Seekender weekend. For more information please check out the Seekender website for more weekend travel inspiration! I hope these tips help you and your family plan an unforgettable weekend getaway! what’s your bucket list trip? I would love the waffles too! I’m planning a NYC trip in July and then Alaska in August. I hope I’m a Seekender too! These are great tips. You never know what kind of illness will strike on vacation, and what you’ll forget to pack, etc. I completely agree with simplifying your trip and expecting the unexpected. On our last trip we tried to do “everything” and ended up not enjoying it as much as we should have because we just rushed everywhere. Also, we didn’t expect to discover our middle child has severe anxiety attacks (which we wish we would have known about before taking him to an amusement park). Looks like a great trip and those cupcakes look AMAZING! Yes and yes to all of these! You have vacation plans before children and then plans after children, neither of which even remotely resembles the other. Great list! Seekends are the best weekends! It’s so much fun to get out and explore. Photos are amazing and your tips are all spot on. Expect the unexpected…but try and have a few tricks up your sleeves to make it easier, right? Loved seeing you and really enjoyed the hotel. I think it was perfect for a family get away in a great city. I have never heard of Seekender! I love doing little vacations with my family we LOVE to explore! NYC is a great place to go! I have been there a lot, but it has been a long time! O, to not over plan 🙂 tends to be a weakness of mine. Thanks for the tip, I’ll have to remember to do better at that one. I tend to splurge (too much) on vacation too. But part of the fun of traveling is experiencing the regional flavors! I love these tips, and especially to throw out the diet. There is no way I can go anywhere out of town without having something good to eat! Really fun tips to bear in mind when taking mini roadtrips. I am guilty of overplanning a lot of the time and it’s definitely something I have to watch out more. I find a lot of our memorable moments are the “unplanned” and spontaneous ones! I have never had the pleasure of exploring NY. I would love to go with my family too and would consider this hotel. These are some pretty accurate tips, over planning leads to over whelming, and you don’t want that on a seekender weekend. 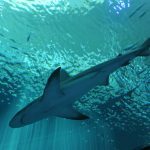 The Zoo is one of my personal favorite places to go with my kids, seems like you guys enjoyed it too. My husband was out of commission for a few years but after getting two new hips we’re back on the road and in the air again. We’re going to have to give Hampton Inn a go! We have a whole bucket list of places to visit including Niagara Falls, NYC and Savannah. Oooh I want to hit Niagara Falls too! This post brings back so many memories for me. The Husband and I stayed in a HOJO in Times Square waaaaaayyy back when. Let’s just say the Hampton Inn would have been several steps up! Your kids are adorable at the Statue of Liberty and with those mustache cups! It can be so tempting to pack in the activities when you go on a trip. I have learned to plan one or two things and see where the day takes us. New York is one of my favorite cities to visit. I need to plan a trip soon it has been to long.This looks like a great hotel. This sounds like a great hotel. I am hoping to go back to NY in the next few months. I will have to spend a day at the Zoo. I love visiting NY! This looks like a fun, fun trip! Oh Kristen, it looks like you had a great time! I am usually guilty if over planning. I’ve tentatively planned a new York trip for December, to celebrate my boys’16th birthday. But I must admit, the Big Apple, with four kids, makes me very nervous! I have yet to travel to New York!! Can’t wait for my little man to get a bit older to travel all around again. When time comes, I know your tips will be very handy. Pinning it for future!